Paraplegic patient had 9-week old pressure ulcer on buttock. Hydrogel, manuka honey and Flaminal Forte, respectively in combination with Durafibre had been tried, but the wound remained non-healing and slowly deteriorating, i.e. expanding. Acapsil was applied once daily for 3 days and initiated healing. From Day 0 to Day 6 there was over 90% reduction in the volume of the wound and the wound continued towards closure. Please see video above for the full story. 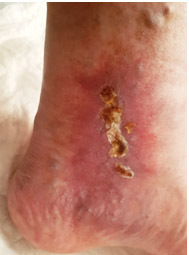 Elderly lady (type 2 diabetic) with 5 year old diabetic foot ulcer on the heel, covering the entire heel. A wide range of approaches had been taken to facilitate healing, but without luck. 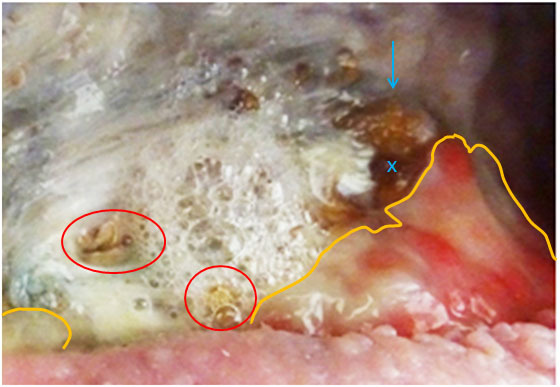 The ulcer was associated with considerable pain in the leg. It had for the past long time been in a full cast for off-loading of the heel. The wound was washed with water and dried, Acapsil was applied and the foot was, as usual, enclosed in a full cast to off-load the heel. The following day, the wound had changed from a dark-red very dull lifeless appearance to a red colour, normal to healing tissue; clear signs of granulation and epithelialisation were present; and the pain level had gone down. This improvement continued the following days; the pain was gone within 3 days of first application and this alone led to a huge increase in the mood of the patient. 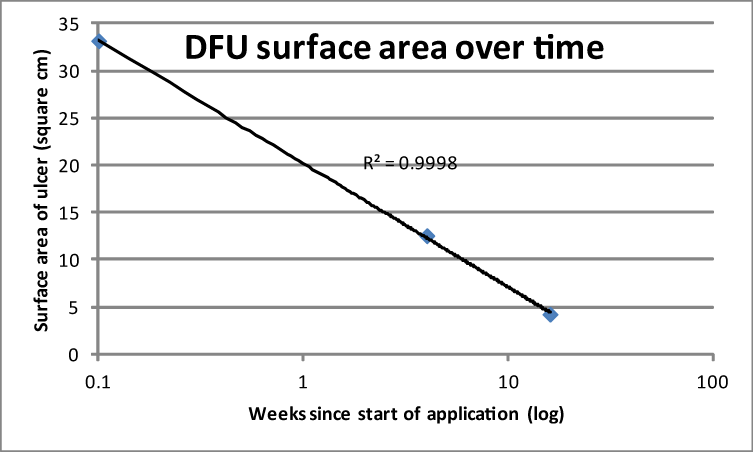 Four weeks after first application, the ulcer has decreased 55% in surface area. Due to the necessity of the full cast, daily application was only achieved the first 3 days; thereafter and for the remainder of the application period, the dressing and Acapsil was only changed twice weekly, As the cast prevents effective evaporation and the circulation of air, it likelly reduced the speed of progress. At 16 weeks after first application, the wound had closed by 85%. The graph below plots the surface area of the ulcer as a function of time. The x-axis is logarithmic and a common phenomenon in biology is that changes follow a log-function instead of a linear function. The R-square value is 0.9998, which means that the correlation is very close. The graph shows that the healing of ulcer has proceeded at a constant speed since starting the application of MPPT. This means that the ulcer has not suddenly stopped and then a few weeks later started again, but has improved continuously. 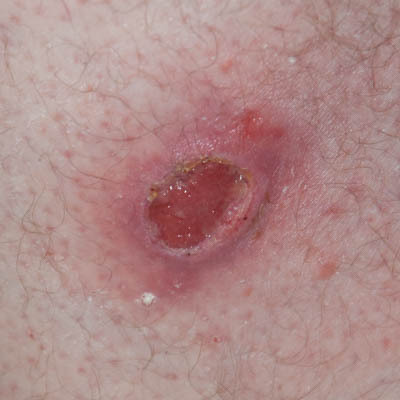 The curve itself is unique to this ulcer and reflects the healing process in that specific patient under those specific conditions. Usually the healing process is much faster. 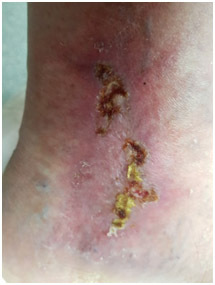 A 51-year-old gentleman had developed a venous stasis ulcer on the foot in the malleolus area. He was 6 ‘ 10” / 2.10 m tall and his work involved standing up for 10 consecutive hours daily. He would always wear compression stocking when at work. This would not be associated with a cardiovascular condition. On the same leg as the ulcer, he had an enlarged calf as an idiopathic condition, probably genetic. He had a 25 year history of varicose veins with surgery 20 years previously due to venous leg ulcers. Up until now, this had kept him free of vein problems. For the first 4 weeks the ulcer had been managed with standard plain dressings and the severe pain had been just manageable with codeine/paracetamol every 6 hours (this made the daily use of laxatives necessary). However, an infection developed. The patient was dressed with honey underneath full compression. The pain was reported to be excruciating and not controllable with the permitted maximum daily dose of codeine/paracetamol. As the ulcer had not improved after two weeks, the treatment was changed into iodine dressing under full compression. The pain level would increase even further and this forced the removal of the dressing after 3 days, i.e. 4 days prior to the planned dressing change. 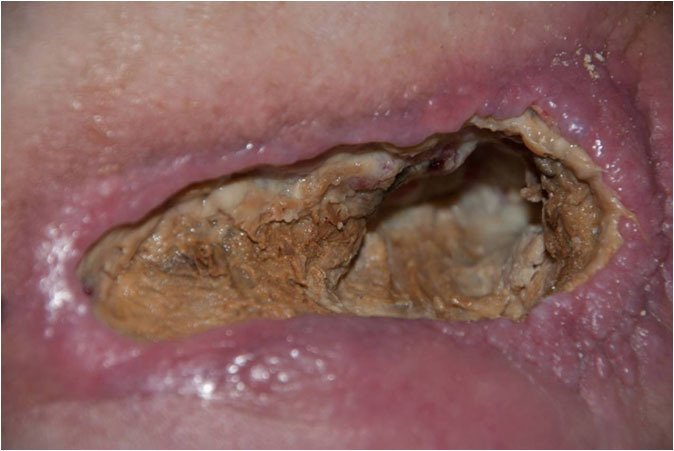 The ulcer was left for 6 days dressed with plain occlusive dressings. The pain reduced to the level of “excruciating pain”. As the infection and the pain were still uncontrolled, PHMB dressings under light compression were applied for 10 days during which the pain remained unchanged. After 10 days with PHMB, the infection was still not under control and Acapsil was tried. Acapsil was applied on Day 0 and 1. 24 hours after the first application, the infection had cleared and the pain was halved. This measure was based on the need of pain-killers being halved. Within the subsequent 24 hours the pain reduced again to the level that only 1 dose was needed in the morning (the use up till this point in time had been 1 dose every 6 hours and that would not control the pain). Over the next days the pain continued to reduce steadily and three weeks after first Acapsil application, the patient would need no more pain killers. As the infection was cleared after the second application, the wound started healing with no further need of treatment. The wound was left with a permeable contact layer dressing kept in place by stockinette. It was checked and the described dressing changed after 3, then 5, then 7 days. After that, dressing changes were performed every other week and this was then extended to every 3 weeks. On Day 90, the patient was discharged from the GP surgery as they did not consider their supervision necessary. The wound was 2 x 3 mm, non-infected and causing no pain. Upon first presentation at the GP surgery, the patient had been told to expect between 6 and 9 months of weekly dressing changes with full compression. He had also been warned that full healing was questionable. Acapsil had been able to resolve the infection after two applications, the pain level began to subside immediately and the patient was discharged after 3 months. 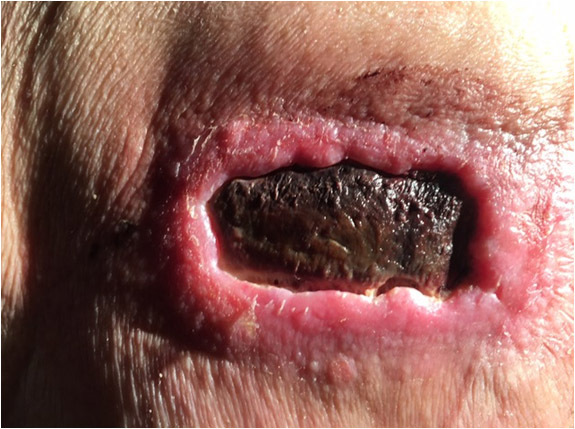 As the conditions of the vein causing the ulcer in the first place were too severe for the skin to be able to close fully over it, the patient was referred to a cardio-vascular surgeon for evaluation. After in-depth evaluations, these assumptions were confirmed and the patient was scheduled in for surgery as the venous condition was considered too severe to prevent and/or close future ulcers. The ulcer is expected to close fully following this procedure. As the ulcer and rest of leg was no longer infected, the surgery could be scheduled in without regards to this and the potential of ensuing complications was reduced. A 74-year-old lady had received very high doses of radiotherapy 35 years ago to treat cervical cancer. This had created an abscess which 35 years later, in March 2017, revealed itself as a sizeable patch of eschar (dry, black necrosis) on the right side of the lower back (Pict. 5 April 2017, see below). Approximately a month and a half later (Pict. 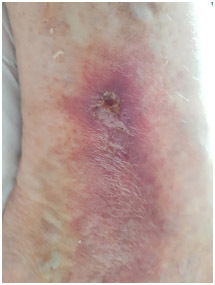 20 May 2017), the patient developed toxaemia; was hospitalised to ICU (intensive care unit); and received iv antibiotics for 4 days where-after the abscess was surgically debrided, exposing an infected wound with a 10 x 2.5 cm opening. The depth was 6.5 cm without finding viable tissue at the bottom. The “floor” of the wound, as it appears in the pictures, was directly on top of bone suffering from chronic osteomyelitis. This bone infection needed to drain into the wound. For one month following this debridement, the wound was packed daily with Manuka honey and dressed with superabsorbents to resolve the remaining necrotic tissue and to promote healing. However, after a brief appearance of a few granulation buds at one edge (Pict. 13 June 2017), the wound regressed, grew in size to 12x3 cm and the necrotic tissue dried and formed a 1 cm thick dry and leathery layer on top of the entire wound. A severe, deep and wide undermining along half the perimeter of the wound developed and the skin significantly thickened and hardened (an indication of the potential presence of toxins). 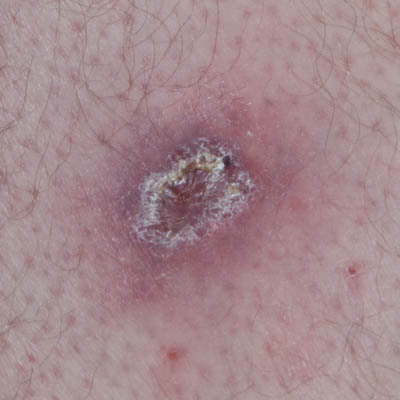 Broad purple-red wound edges and peri-wound area were evident, indicating high risk of cellulitis. The wound became increasingly infected and highly malodorous and the patient showed overall renewed signs of toxaemia (Pict. 23 June 2017). On the 27th of June, Day 0, the use of Manuka honey was stopped and daily application of Acapsil was initiated. A MRI was performed, which identified a 20 cm deep 3 cm diameter tunnel, leading from the right-side bottom of the wound down along the right femur. This was running along the main vessels and nerves and was tightly filled with cheese-like slough. Similar to the hip-bone, the femur also suffered from chronic osteomyelitis and needed to drain into the tunnel. The wound was washed and Acapsil applied. After 24 hours, the overall signs of toxaemia had reduced (not disappeared) and the wound showed signs of granulation to the front rim at the leftmost corner, the “ceiling” and the “floor”(Pict. 28 June 2017, Day1). Over the following months, with some interruptions, the wound was thoroughly washed and Acapsil was applied more or less daily to roughly all accessible wound surfaces, including exposed osteomyelitic bone, undermining and as far possible into the tunnel until blocked by slough. It was covered with a permeable contact layer dressing and a 2-ply gauze. The wound progressively cleared and granulation tissue and new epithelium around the wound edges appeared and grew gradually stronger (Pict 05 July 2017, Day 9). The malodorous infection of the entire wound resolved. The ongoing necrotizing stopped, large amounts of the existing necrosis dissolved via autolysis and the underlying viable tissue started to build up via steady granulation. (Pict. 23 July 2017). In the floor-area of the right hand side of the wound in front of the hole marking the entrance to the 20 cm deep sinus, an area gradually cleared very deep down until reaching viable tissue, including a 0.5 cm wide, 10 cm long and 4.5 cm deep ridge (Pict. 25 July 2017). 30 July 2017 - The area between the granulating “ceiling” and the white and structured fascia on the “floor” is a necrotized vein that is in undergoing removal by autolytic debridement. During the course of the following month, the wound would build strong new tissue from the entire ceiling and right-hand side of the wound (Pict. 02 August 2017) (Pict. 17 August 2017) as well as the right-hand side deep floor area in front of the sinus entrance (Pict. 29 August 2017 - 1). For reasons external to Acapsil and the wound, the left upper corner had up till now mostly been left uncovered with Acapsil during applications and was, therefore, lacking behind still needing to undergo autolytic debridement of necrotized non-soft-tissue, e.g. vessels (Pict. 29 August 2017 - 2). After 2 months with Acapsil, 31 August 2017, the 20 cm deep sinus down the leg running along the osteomyelitic bone cleared of the remaining cheese-like slough and remained clean. Only one day later, there was a remarkable change in the purple-red coloured cellulitic peri-wound skin. The inflammation started to contract in width and the skin gained a healthy pink colour. At this point in time, the hardened skin along the entire bottom edge of the wound also started to slowly fuse at the bottom thereby starting to clear the undermining. Further, off-white coloured new epithelium generated on the edges themselves. Furthermore, the volume of the wound had reduced considerably (Pict. 02 September 2017). The high-risk issues in the wound had been resolved, the healing was progressing well, and it was decided to change the application regime to every other day. The wound continued to move rapidly along the path of healing with granulations building from the ceiling; back wall; right hand side of wound; and floor area in front of the right hand sinus entrance (Pict. 13 September 2017) (Pict. 07 October 2017). The osteomyelitic left-hand side floor area was kept clean and granulation was slowly making its way over the fascia (Pict. 13 September 2017) (Pict. 17 October 2017 -1). By mid October, the wound had reduced approximately 50% in volume (Pict. 17 July 2017-2); there were no signs of wound infection; and the patient was overall performing remarkably well. For the duration of the period of Acapsil use, a consistent feature was that as soon as an area had been cleared of necrosis, it started to granulate. Granulation would always make its first appearance as a distinctive white layer of proliferating cells and over the following couple of days, this would turn pink as the angiogenesis took place and the granulation matured. Another consistent trait throughout the period of removal of infection and necrotic tissue as well as tissue formation was, that the immune system would seem to work the deeper tissue and deposit the resulting waste as sloughy exudate on top of the wound, even on top of areas with strong granulation. The healing process was, therefore, assisted by a daily wash to remove this toxin containing waste material without causing damage to the forming granulation tissue. 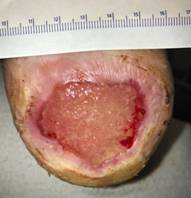 Due to the presence of extensive and chronic osteomyelitis (bone infection), the patient had been referred to the national specialist unit for osteomyelitis at Nuffield in Oxford. Osteomyelitis of this magnitude, severity and in the relevant area could only be treated via life-threatening major surgery and with uncertain future perspectives of quality of life for the patient. The consensus of the specialist team was, therefore, to try to manage - not cure - the osteomyelitis with the use of antibiotics. The success of this option would, however, depend on this extensive and infected body opening (the wound) being brought under control. Furthermore, as the infection of the bone would persist, it would always continue to drain microbes and their toxins into the wound. Therefore, a long-term solution to manage these conditions and avoid further infection or necrosis in the wound was sought for. 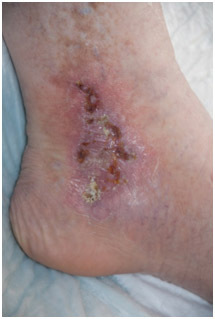 keep infection and amount of toxins in the wound below the threshold of causing toxaemia. At this point in time, Acapsil had accomplished all of these wishes and was continuing to keep the wound controlled and healing. All expectations had, consequently, been exceeded and the patient could go back to the team in Oxford with high hopes. For the period from March 2017/October 2017. 35 years ago my wife was one of the first people to live through cervical cancer after having been given a few months to live. She was at Christies Hospital in Manchester and given a new treatment which included a very heavy dose of radio therapy. Seven months ago, this long forgotten radio therapy resurfaced by creating various abscesses in her pelvis and thigh. When the surgeons opened up what seemed to be a large pressure sore, they were amazed to find a deep wound created by escaping radiotherapy infection from her pelvis and thigh. What they found was a rectangular wound that was 12 cms wide, 5 cms deep and 12 cms into her flesh at it’s deepest point which fed into a 20 cm sinus that ran into the bone. They decided it was too dangerous to continue clearing it and referred us back to the deep tissue viability team. After a further two months, with the use of traditional methods there was little improvement and we firmly believed that my wife would die as the infection worsened. Nobody gave us any assurances that this was not the case. All they knew was that she had chronic osteomyelitis which seemed incurable without a deep tissue operation at the Nuffield Centre, which had less than a 50% chance of survival. We were then introduced to a product called Acapsil. The manufacturer, at that time, thought the wound was too severe for its product to work, but we decided to take a chance. Nothing else was working. Within a month there had been a major improvement. Now, just after two months the wound and the sinus are almost totally clear; granulations are blooming and the flesh has closed down the wound by approximately 50%. Unbelievable. We have kept an accurate photographic record, always with community nurses present, of this amazing transformation. The surgeons and doctors had said they couldn’t do anything with the wound in the condition it was in. We’re now going back to them with an almost clean wound. My wife is in little pain and full of hope as we wait to see what the surgeons and doctors now determine how they can prolong her life. We’re not home yet, but without Acapsil neither of us believes we would have got this far. Acapsil was used on this wound for 4 months from late June to mid-October and had been able to remove a wound infection and advance the healing of the wound. Please refer to the case report “35 year old infected necrotic abscess following radiation therapy”. The wound was practically cleared of necrotic tissue. The purple-red cellulitic wound edges had changed to healthy pink and were epithelialising. The wound had reduced by 50% in volume and was still reducing via strong granulation. The left half of the floor area of the wound was located on top of the osteomyelitic bone. This was clear of necrotic tissue whilst the white and structured fascia on top of the bone was preserved. The grey and brown protrusions through the fascia are deformations of the chronic osteomyelitic bone. Granulation had started to grow back over the bone particularly where the fascia was intact. For reasons external to Acapsil and the healing of the wound, the treatment protocol was changed from the use of Acapsil (stopped 17 October 2017) into the use of PHMB (first application 20 October 2017). After 2 days with only absorbent dressing, the wound was applied every other day PHMB (0.1% PHMB aka Polihexanide; and betaine surfactant) combined with gelling fiber packing covered with an occlusive foam dressing. On Day 6 (Pict. 26 October 2017), froth appeared in one area of the exposed hip bone, indicative of gas produced by anaerobic bacteria entering the wound through holes in the underlying infected bone. This had not previously been seen and the holes had, most likely, formed in the bone since the start of PHMB application. The froth would increase in volume over the subsequent days and continued after PHMB was later stopped. Holes from the wound into the infected bone will increase the ease of access of toxins and pathogenic (disease causing) microbes into the wound. Pictures above showing the development of froth formation. Healthy granulation tissue is pink and, if it is actively granulating, it is covered with a new layer of shiny opaque white cells, i.e. the proliferation layer. As these cells mature and vascularisation is built up (angiogenesis), this gradually turns pink and is easily recognisable as granulation tissue. Vividly granulating tissue will, therefore; usually wear a constant white “cap” of new cells on top of the maturing layers underneath. 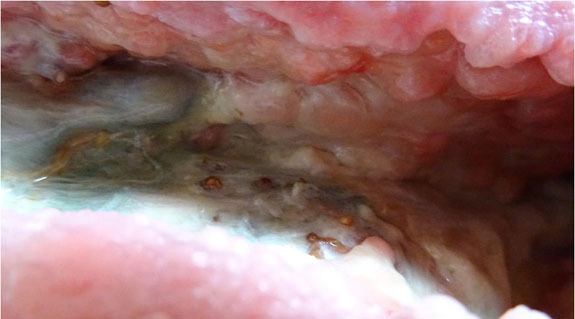 After start of application, the granulation tissue gradually began to lose its white proliferation layer which left the granulation increasingly red and irritated. Regression of the granulation tissue was observed. In areas that had already undergone strong build-up and maturation, the granulation buds lost their white cover, the areas flattened, no longer exposing bud-formation, and even regressed markedly. This is easily observed within the rectangles in the pictures below. Pictures above showing changes to granulation and wound edges. Furthermore, the wound edges changed from epithelialising whitish pink into a shrivelling red-to-purple appearance. The yellow arrows allow comparison of the same locations at the two time points in the picture above. In areas where the granulation had started to move across the fascia covering the osteomyelitic bone, it would regress, as well. 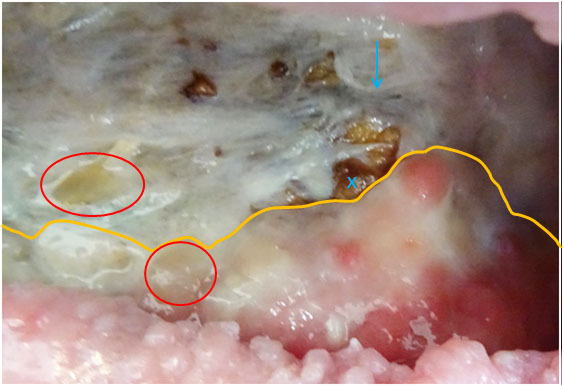 (In the pictures below, the yellow lines indicate the front edges of the granulation tissue). Changes in the tissue, facia and bone across the exposed hip-bone in pictures above. Likewise, the red circles indicate the same positions in the two wounds, showing that PHMB removed the proliferating granulation in both spots exposing holes directly into the underlying bone. Direct communication, e.g. via perforations of the bone, would result in increased release of toxins and pathogens (that cause infection) into the wound. 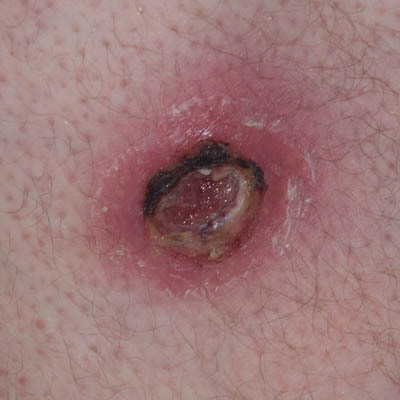 Exudate and slough increased in volume and changed in colour from yellow into dark-brown to black as would be apparent on the packing and outer dressings. After 10 days’ use of PHMB, an acute pain syndrome developed in the wound, where-after the use of PHMB was stopped. All these changes were indicative of cytotoxic damage to the cells. As PHMB remains in the cells for several days, a 7 day wash-out period of PHMB was required. During this time, the effects initiated by PHMB continued. The patient returned to the use of Acapsil and over the following month the changes were gradually reversed and the strong healing process restored. The pictures below are from 4 days into the wash-out period and 2 months later and show considerable reduction in wound volume. Acapsil was applied to the wound for 4 consecutive months - including directly on top of osteomyelitic bone - and strongly supported healing and caused no side effects. 10 days of PHMB application caused cell damage and regression of the healing process. Acapsil reversed these effects and returned the wound to a quickly progression of healing, again with no side-effects. The cytotoxic effects seen with the use of PHMB have also been identified in cell culture studies (Yabes et al. 2017) and in a recognised animal model of wound healing (Carroll and Ingram 2017; Carroll et al. 2017). See the section on Antiseptics. A 55-year-old gentleman had been bitten on the lower part of the thigh, presumably by a spider, while asleep. The site grew increasingly swollen and irritated. 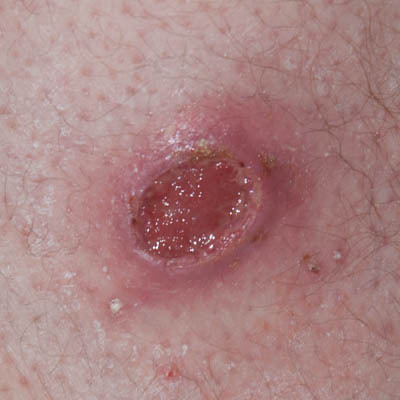 Upon completion of a course of antibiotic the bite re-initiated its growth in size and soreness over the following two weeks. 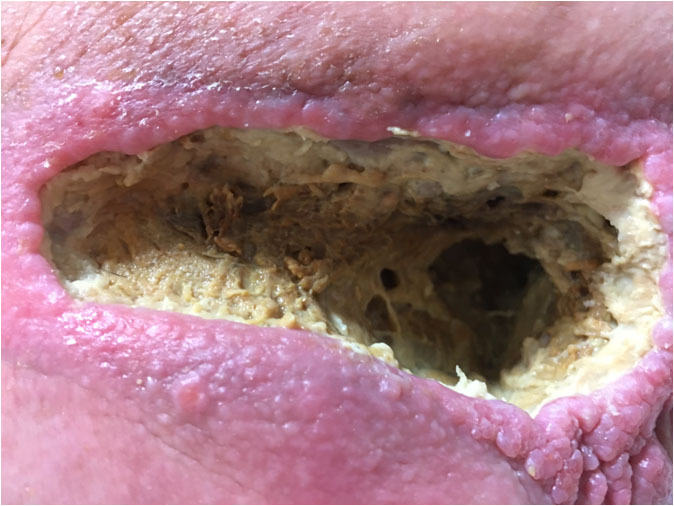 A second course of a different antibiotic was prescribed and an immediate effect was seen, but after 24 hours the effect ceased and the abscess grew back to its original size and soreness. 24 hours later, despite the course of antibiotics still ongoing, the patient developed a fever and there was suspicion of toxaemia. Therefore, the abscess was opened surgically on that same day. On Day 0, upon surgical opening of the abscess, it was drained of liquefied black blood and necrosis. The abscess was 2 cm deep and the inside of the abscess would consist of soft, non-viable tissue. No type of surgical debridement was performed as the extent of the necrosis induced by the toxins clearly still in the tissue was impossible to determine and would likely have caused extensive bleeding. 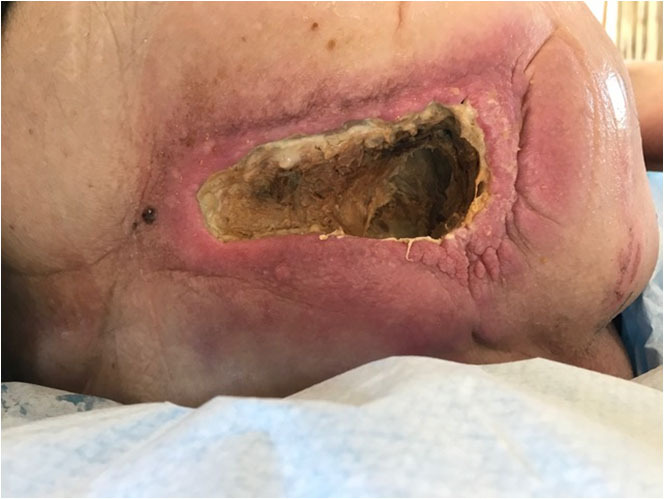 Indications were, that the toxin-affected area was extensive based on the large inflamed peri-wound area and the rapid enlargement of the abscess but a defined border between viable and non-viable tissue was unclear. The wound was cleaned with isopropyl-alcohol (70%), then tap-water and Acapsil was applied. As the day progressed, the entire inside of the now opened abscess was rapidly blackening and necrotizing. Late in the day, the wound was filled with liquefied black discharge. It was washed with water and Acapsil applied. On Day 1, the patient’s overall state was much improved, the fever had resolved and the peri-wound redness had already reduced. This was taken as an indication that the ongoing expansion of the abscess had ceased. On Day 1 and 2, due to the reluctance to perform surgical debridement, it was decided to perform very light chemical debridement, i.e. by the use of hydrogen peroxide (3%), applied 2 times 10 seconds followed by thorough washing with tap water. This would be followed by Acapsil application and covered with a 4-ply lint-free swab (gauze pad). On the following 2 days (Days 3 and 4) the wound would be washed and Acapsil applied twice daily. After this, washing and Acapsil application would be performed once daily. Over this 5 day period (Days 0 to 5), the distinction between viable and non-viable tissue would gradually become clear. The necrotic tissue would turn black and be removed via autolytic debridement and the peri-wound inflammation would reduce considerably. On day 6, the wound bed and sides were debrided sufficiently to show fully viable tissue and the wound could be sized up to a 2.5 cm deep area with an opening of 3 x 4 cm. From Day 1 to25 necrotic slough and waste would every day be present on the secondary dressing (4-ply gauze pad) and be lifted out of the wound with the removal of this. This was taken as an indication that the toxins were still present in the deep tissue and that the potential damage was being kept at bay by the immune system supported by Acapsil. This assumption was supported by the ability to reduce the peri-wound inflammation while the sides of the wound remained stiff and elevated. On Day 25, the wound had granulated up fully to level with the wound edges which were no longer elevated and stiff. Furthermore, the inflamed peri-wound area had reduced considerably and together these signs were taken as an indication of the influence of the toxins on the entire area having reduced sufficiently for the healing to progress unaided. From Day 26-29, washing and Acapsil application would still be performed to prevent any potential set-back. Day 30-32 the wound was dressed with a silicone open mesh contact layer dressing. However, this seemed to impede healing and on Day 33 the wound was left uncovered for a few hours. 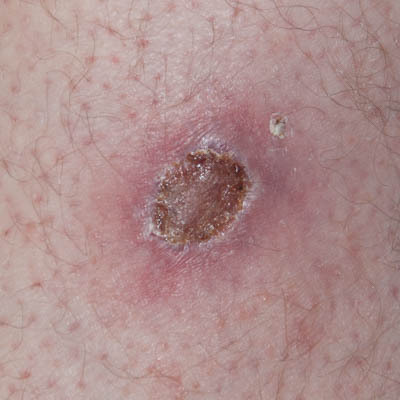 This would dry out the area and facilitate a light natural scab to cover the wound. After a few hours, the wound was left uncovered under the trousers to heal. It was inspected every 1.5 weeks and at no point in time did it need any attention. On Day 60 the wound was closed. Patient was seen 2 years later for reasons not associated with the wound. The soft tissue had continued to build up beneath the skin all this time and the scar was now levelling with the surface of the surrounding thigh. Also, the scar had continued to reduce in surface area. The patient had experienced no wound infections or other complications and there had been no soreness of the area since closure. The area had been slightly itchy for the first 6 months after closure on days with very hot and humid weather. The 59-year-old patient was hospitalized with a two-week-old thermal full thickness burn on the right thigh and shank, 4%, degree ІІІ B. The state of the patient was moderate, body temperature 38.5°С, the whole surface of the skin and subcutaneous basis in the affected area was necrotized with dense scab (eschar). The necrotic tissue was surgically debrided. Acapsil was applied to the wound surface. After 2 hours the temperature decreased. A complete wound cleansing took place over 48 hours. Besides Acapsil, the patient received only analgesics and vascular agents, because he was allergic to antibiotics of the most commonly used groups. Acapsil was applied for a total of 3 days. The wound healed completely over 17 days. A woman (type 2 diabetic) had broken her leg at the level of the ankle, and a metal plate was fixed on each side of the leg. Both wounds had dehisced and were infected deeper and wider than apparent on the surface. Standard of care treatments had been provided over a two months period to promote closure, but without success. The lower leg and foot were kept immobile via a closed, easy to apply and remov,e total contact cast boot. Acapsil was applied and covered with Mepitel One and gauze. The patient needed to continue using a closed plastic boot which created an anaerobic environment and impeded evaporation and access of air. After the first application the wound began to clear up, including the deeper infection. Daily application was continued for a total of 4 days, whereafter it was changed to once weekly. The wound dehisced fully until reaching viable tissue and all non-viable tissue along the wound edges disappeared. After a total of 7 applications, the wound was clean and healthily granulalting. A 43-year-old male patient was admitted to hospital with a two week old gun bullet wound complicated with inflammatory colonisation and infiltration of the anterior abdominal wall. Upon examination, an infiltration 11.0 х 6.5 cm in the left iliac area was identified. In the infiltration centre there was a bullet hole 1.5 х 0.7 cm leading into a 3.5 cm deep tunnel. The tissue surrounding the hole and the tunnel was necrotized, inflamed, oedematous and of a dark colour. A bullet was found at the bottom of the wound tunnel. The bullet was surgically removed and surgical debridement was performed. 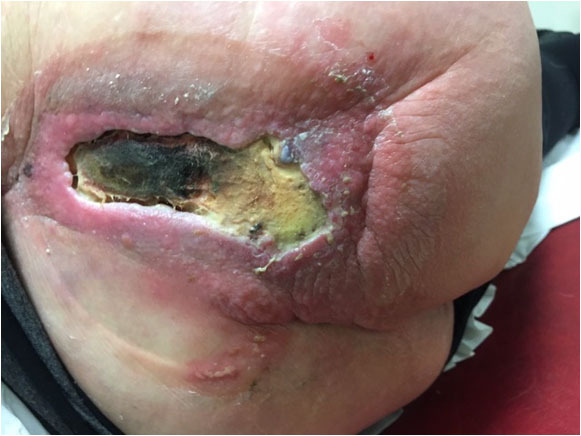 During the following week, the wound would be dressed with iodine based dressings and the patient would receive systemic antibiotics and antiinflammatory analgesigs. The performed treatment showed no substantial effect. The degree of colonisation and infiltration remained unchanged and no evidence of wound healing was observed. The patient rejected outright the proposed surgical excision of the colonised and infiltrated area. It was decided to apply Acapsil to the wound and the entire tunnel after brief chemical debridement with 3% hydrogen peroxide. Acapsil was applied for 2 consecutive days and during this period the wound tunnel was cleared completely of slough started granulating. Over the following 7 - 8 days the broad peri-wound colonisation and infiltration reduced significantly to 3.0 x 2.5 cm, the tunnel granulated from the bottom up to surface level and the wound started epithelialising. Within 14 days of the first Acapsil application, the wound was fully healed and the peri-wound infiltration had resolved. 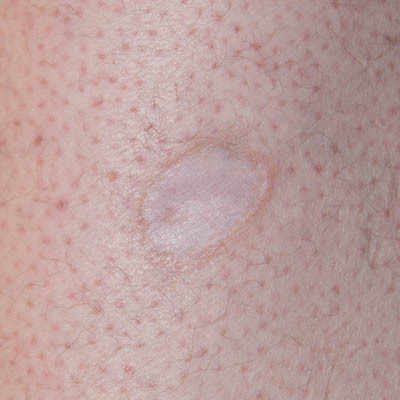 The patient was seen one month later and only a superficial scar of 1.0 х 0.4 cm was found. The patient experienced no discomfort.